The Gifting of the Socks. 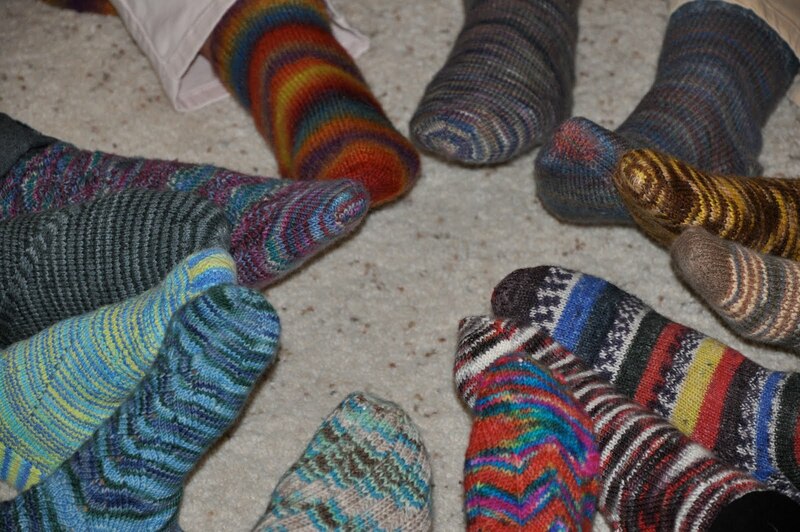 Ever since I picked out the clothes for my mom to wear, I wrestled with the idea about how I would deal with the remaining 19 pair of handknitted socks I had made for her. This idea popped into my head sometime during the night before her services. After the service, family and close friends would be gathering at Robbie and Blanca’s house. What better time to gift them than this afternoon when everyone was gathered together in remembrance of my mom? I picked the socks up at my mom’s house. In the living room at Robbie and Blanca’s, I spread them out on the floor, sorted by method of construction. Top-down heel flap and traditional gussets, then toe-up Personal Footprints. I sorted each section according to fiber content—100% merino superwash, 75-25 blends, cotton-lycra blends. For those who know sock yarns, you can see lots of Blue Moon Fiber Arts STR, a couple of Regia, one Mini-Mochi, one Colinette Jitterbug, and some Opal. As I sorted them, I told the story of each sock. It was stroll through my life and my sock-knitting life starting in 2002. In the journey that is life, my knitting marks where I was, what I was doing, and what I was thinking at that point. I remember I started with the self-striping yarn from Opal, I discovered it when I helped Carson move for his first semester at Brown. From Opal, I moved into Jitterbug and Brown Sheep hand dye, played around with Cascade Fixation, and fell totally under the spell of the Blue Moon. I was constantly in search of the perfect sock and my mom was a more than willing participant in my quest. My mom loved these socks. She told me once, about 2 weeks before Christmas, that the only socks she could wear were the ones I knitted for her, all others hurt her feet. At that time, I had 2 pair finished, one about halfway done, and another pair that I had just cast on. I turned up the knitting to high speed and I think I gave her 3 pair with the 4th on the needles. In the telling of the stories, more and more of the giftees became entranced with the socks and how they played into the life of my mom and I. Each one had its own history, when it was knitted, where the yarn came from, why some of them were worn more than others. What kinds of shoes she worn them with. What her likes and dislikes were as far as fit and color. She loved to wear denim, so many of them were blues. Differences in construction, heel flap and gussets as opposed to personal footprints. Monkeys, Jaywalkers, purl when you feel like it, hand dyed, self patterning, toe up, top down, Rare Gems, Socks That Rock, and on and on. My mom loved them and I could think of nothing better than for each of them to have a part of something she really loved. One of the asked if I was going to give them out, I told her no, I wanted them to each pick a pair- first come, first served. It was a shark-feeding frenzy that ensued! While listening to the story of the socks, unbeknown to me, they were all eyeing them and had located the ones they wanted. When given the go ahead they pounced on them and claimed a pair. I am sure my mom would approve. After a while, we gathered for a photo session. After everyone picked out their socks, I was asked several times “please tell me the story of my socks again, what is the name of my sock? what is the name of color of my sock? 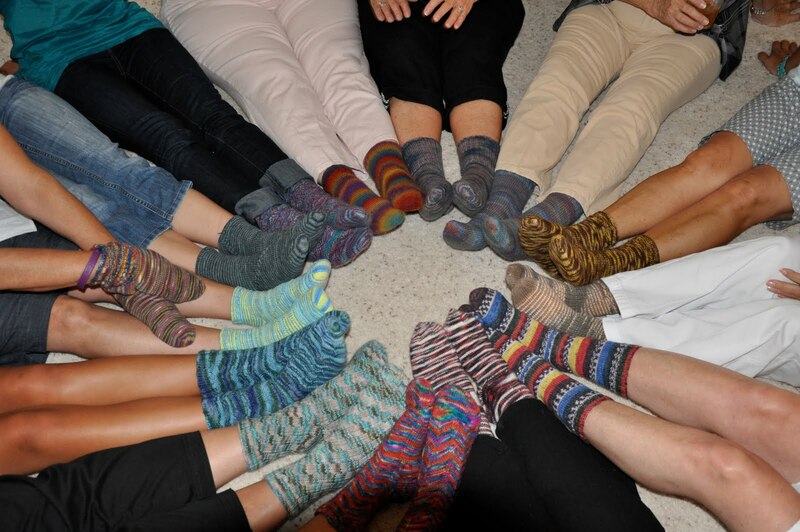 Where did my sock come from?” It was therapeutic and it turned a task that would truly paralyze me into a wonderful thing to share, The Gifting of the Socks. What a great idea! Everyone looks pleased with their choice, too…. that's great! truly amazing actually. Only too perfect! Love what you did and what a great way to share with friends through all the knitterly love you shared with your mom and can now be passed on.